Congratulations to all the winners & Thanks for your participation ! Winners will be informed about the reward via Email ! Hi, Regret the delayed response, performing task is very easy , just follow the step wise guidelines and be eligible for winning ! Kya ye sab fake hai. Hi, Nothing is fake on VuLiv, please let us know why you think like that, we are ready to answer all your queries. Hi, You might have faced a temporary issue, please retry once & let us know your revised feedbacks ! Ye sab fake hai ...! Dear Hakim, Please note VuLiv is not a reward app but its a Media Player which gives users the Best Media Viewing Experience, in case you are here just for rewards we request you to please try other REWARD Apps available on Play Store ! Hi, Regret the experience, please recheck & let us know your experience ! Paytm grab nahi aa raha hai.aur itna vdo dekhtahu fir vi 1 rupiya de raha hai kuen? Hi, Please note VuLiv is not a reward app but its a Media Player which gives users the Best Media Viewing Experience, in case you are here just for rewards we request you to please try other REWARD Apps available on Play Store ! Dear Mady, Please retry and let us know your revised feedback ! Hi, Regret the experience, please retry & let us know your revised feedback ! Watching video and add but do not show Grab option in paytm. How I find grab option?? Garb option nahi show ho raha hai. Grab option dik raha hai but payment nahi aa raha he.aur jab aa raha hai tab din me 1 Rupes.why? Dear Nitin, Reward will be given in 1st week of June ! Hi Nitin, Hope you have received your rewards, just for your information you are only guy who have won 3 times ! Supper congrats ! Dear Vijay, VuLiv is all about Media Viewing Experience on VuLiv Player, we urge you to experience it yourself & have fun, we are confident that you wont even bother about GRAB option anymore ! Dear Vijay, VuLiv is for having the Best Media Experience, experience it yourself and we are sure you will hardly care about GRAB button ! nitin soni bhai u just won 3 tasks. great job bro. 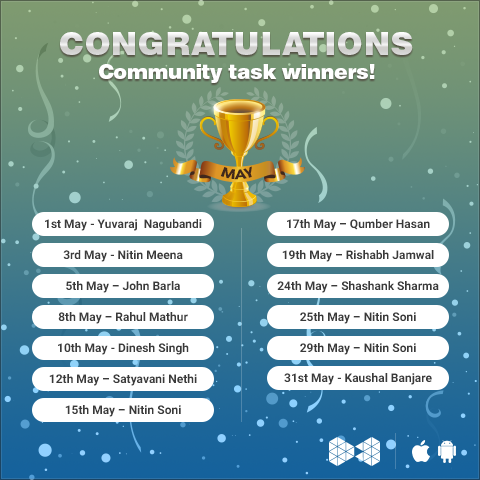 Yes Nitin is a VuLiv Task Champion, scored a hatrik already. Sur plz paysa kast mil sakty hai.